Persoonia linearis is widespread along the east coast of Australia growing from coast to mountains. 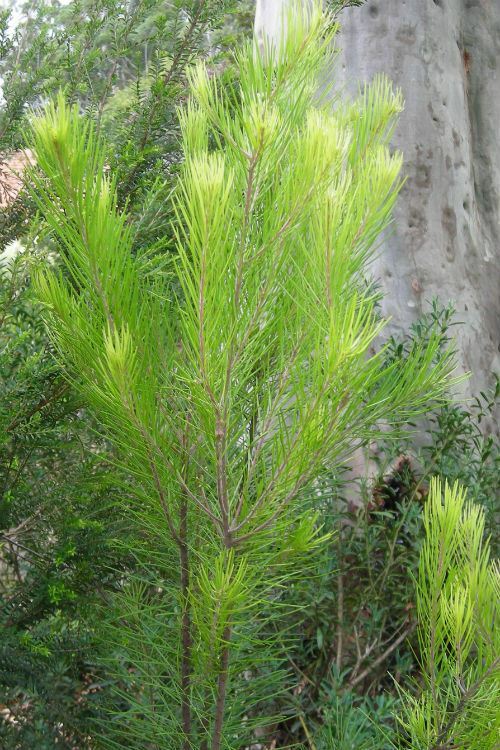 There are approximately 90 to 100 species of this plant in Australia. The flowers, borne on the end of the branches are yellow 10 to 15 mm long and cylindrical in bud. Flowering occurs for a long period in summer. The new growth of the thin, flat leaves is very attractive (a pleasant soft green) and the foliage is often used as a ‘filler’ in floral art. Persoonia linearis grows to about two to three metres tall with a smaller more open spread. It has oval fleshy fruit that is quite edible, but only after it has ripened and fallen to the ground. I have found them to have a rather austere and astringent taste that stopped me from trying a second one (perhaps they were not ripe enough). 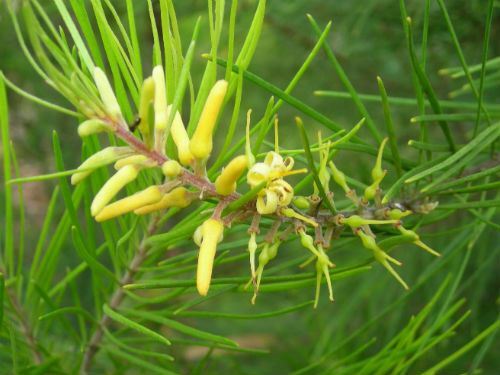 I have been growing Persoonia linearis for nearly twenty years in my garden in the northern Sydney suburb of Westleigh and found them to be a reliable and fairly tough plant. My plants are growing in a thin layer of topsoil over a clay sub soil and receive little additional watering after the first year or so. They grow best in a sunny, well drained position together with a mulch to ensure a cool root run and need no maintenance. The only trouble you will have with them is finding one to purchase as they are difficult to grow from seed or cutting. This plant deserves to be grown more widely in our gardens owing to its attractive blackish fine papery bark (which is reddish underneath), flowers and new growth. linearis: having narrow or 'linear' leaves.